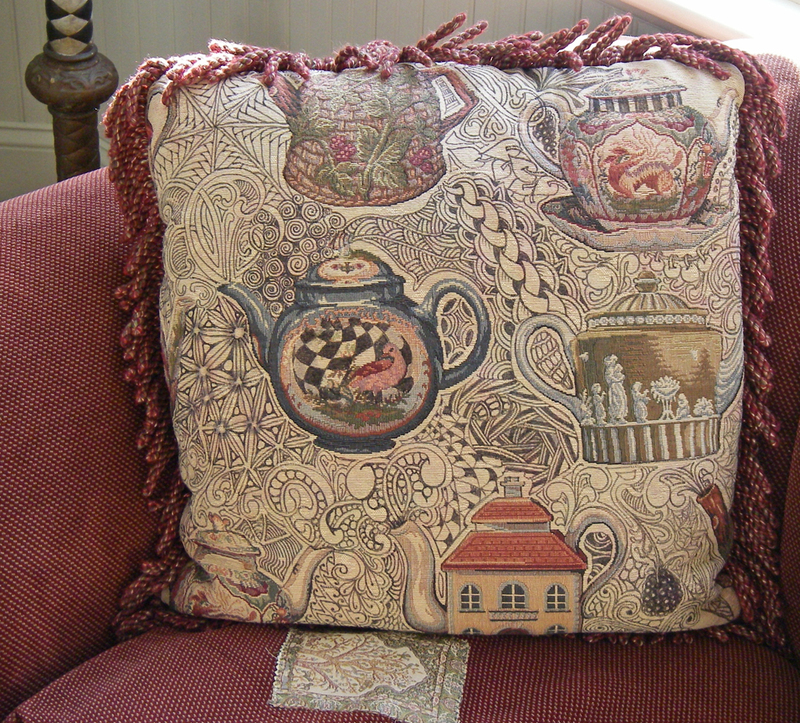 Maria decided that this tapestry pillow she made twenty-something years ago needed a Zentangle makeover. 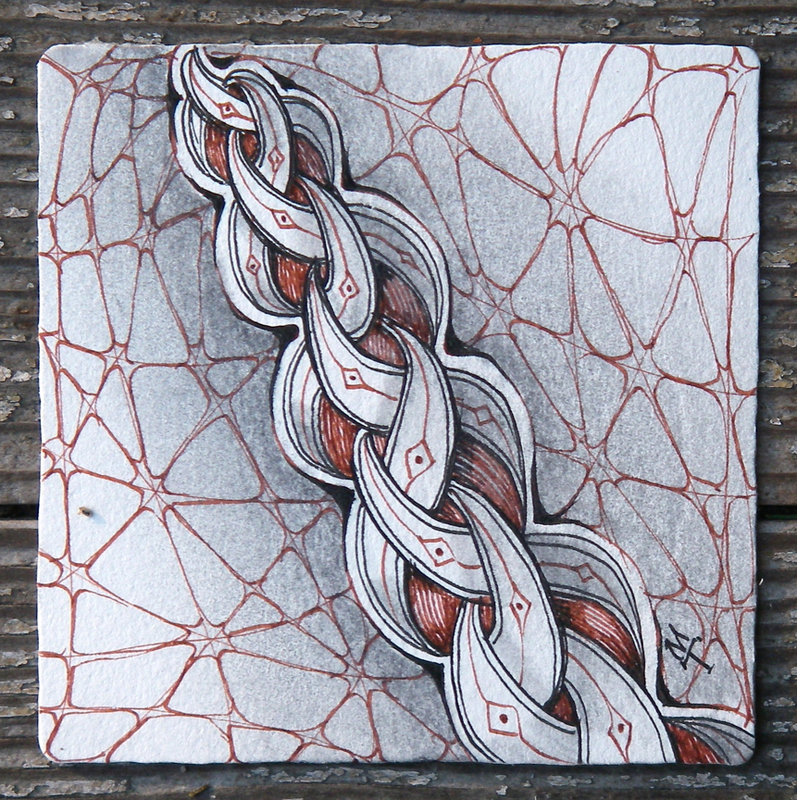 Using a black Sakura IDenti®-pen and a grey Fabrico® dual tip marker, she tangled away . . .
One of our favorite Zentangle themes is that "Everyone is an artist." 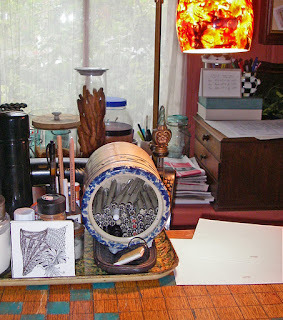 When you are an artist you can do things differently and people will admiringly explain it to themselves with, "Oh, that's OK, she's an artist!" For example, if you look at that second picture above, you will notice that our couch cushion is patched. It's a wonderful couch and a comfortable couch. It's also an old couch. When a cushion was stained, we didn't want to get a new couch so Maria "fixed" it with a piece of tapestry. Everyone who visits thinks it's a great idea and quite okay because, after all, we're artists and artists do that sort of thing. 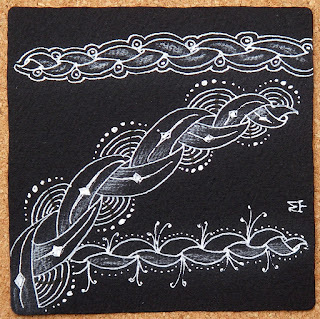 And with Zentangle's method, you also have a justification (if you need it) for all sorts of creative inventiveness, like patching your couch cushion or bringing life to a tired old pillow, because after all, you are an artist! 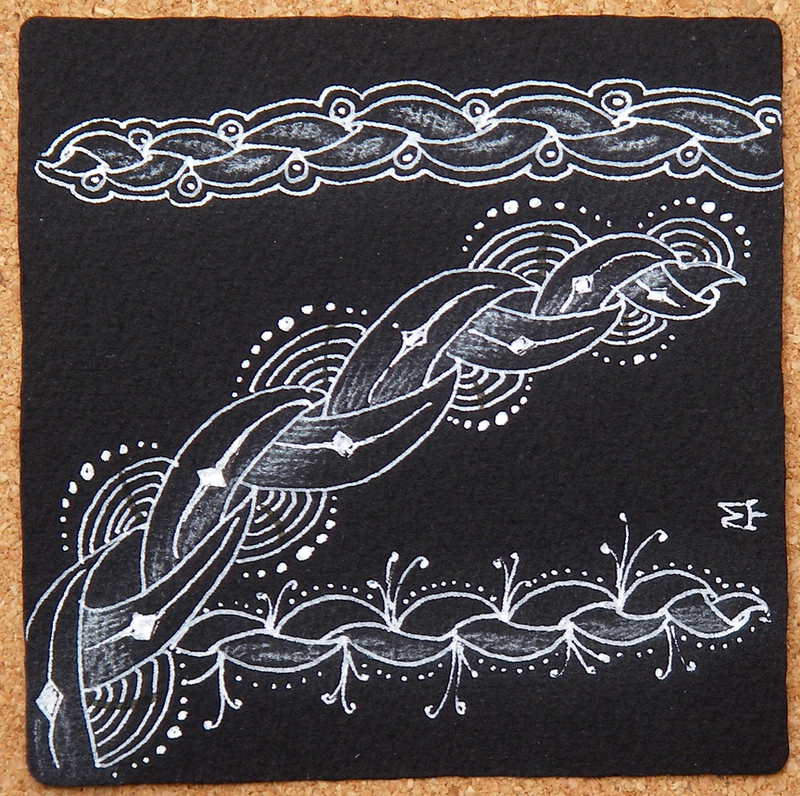 In the midst of so much daily Zentangle info, we want to bring this opportunity to your attention and to give a hearty "Happy Anniversary!" shout out to Margaret. Margaret has been so generous with her time and talents through her words and her precious Zentangle creations in her blog posts. 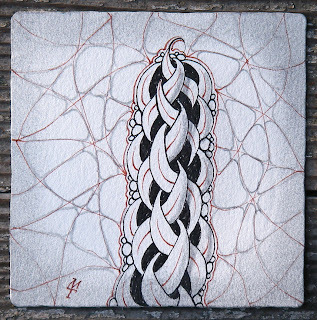 She carefully acknowledges the names of all tangles and describes in detail her step-by-steps. 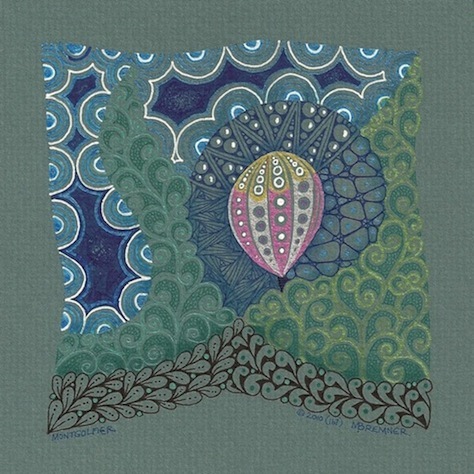 She takes the time to share really wonderful tidbits and snippets of interesting things she has come across (that may not, at first glance have anything to do with Zentangle), and she sets a tone of artist and teacher in a relaxed and intimate manner. 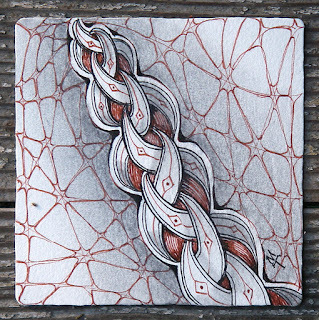 Click here to take a chance at some beautiful Zentangle creations. We know it's best to store your Pigma Micron® pens horizontally. Still, we kept putting them vertically in cups on our kitchen table. 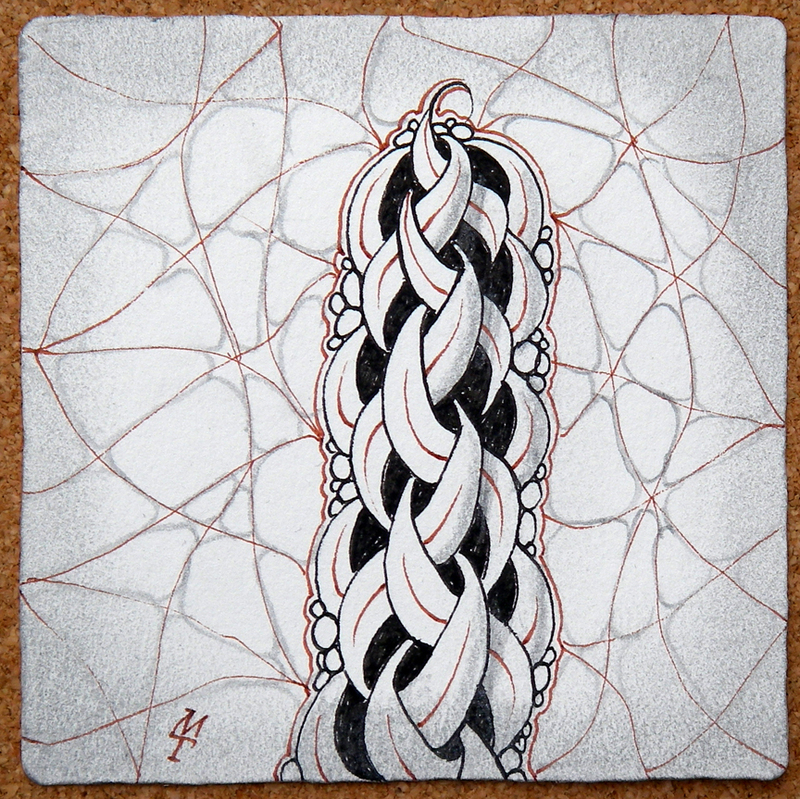 There are no mistakes (in Zentangle)! Punzel and . . .
We also noticed that Laura Harms, CZT, is using punzel for her next challenge. We look forward to seeing your punzel contribution there! Thanks again for enjoying this wonderful adventure with us. If you have any questions or comments about this issue of our newsletter, you can post them here. Here's one amazing group of talented and passionate individuals! It is such an honor and thrill to be associated with these people with such diverse backgrounds and stories and who are excited to share Zentangle. Everyone had a wonderful time making new friends. We heard inspiring stories of people's Zentangle experiences, plans and projects. Countries represented at this seminar are Australia, Canada, India, Japan, South Africa and the United States. In the days and blogs to come we will share in pictures and words some of our adventures. But the pictures and words can only hint at the powerful personal experience we all shared. We are beyond grateful to all who chose to spend time with us, to all who helped this event to run smoothly, and to our family. MUCH much more to come and to share. We will also link to others who are blogging about their experience. 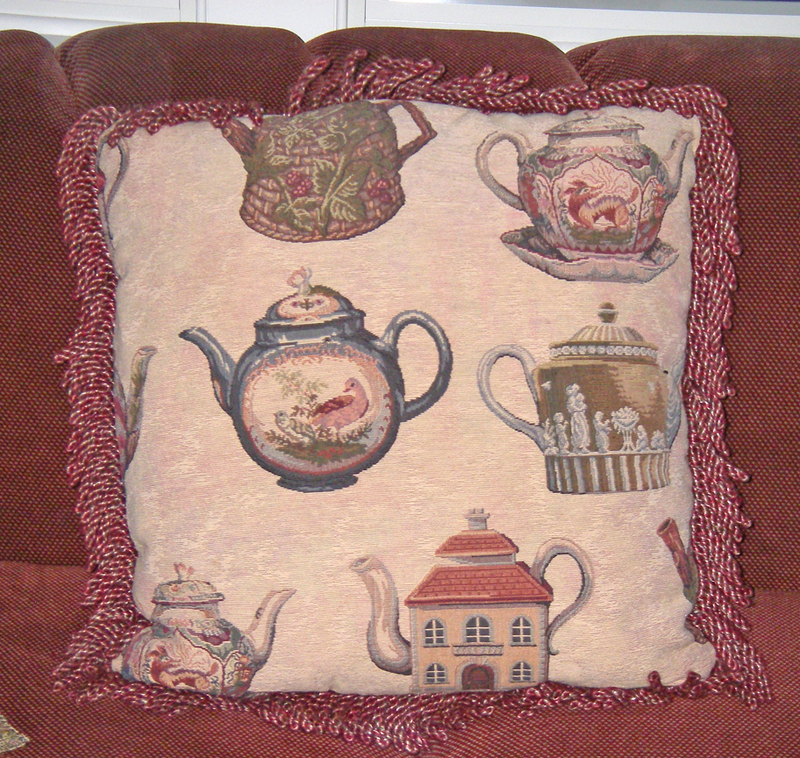 Here's a sample from Linda Farmer of TanglePatterns. Our thanks to Daved Levitan for taking this picture. This is "I Am the Diva's" Challenge No. 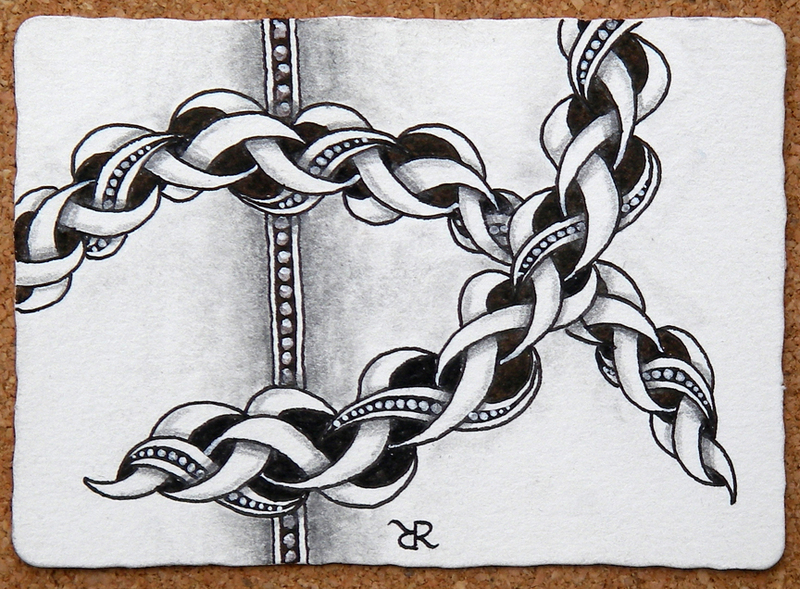 42 . . . "Strength, Courage, Hope." To me, this was a difficult one to illustrate without using language . . . which is how I like to do it . 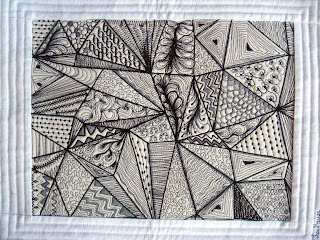 . . Zentangle-style. I decided to focus on STRENGTH. 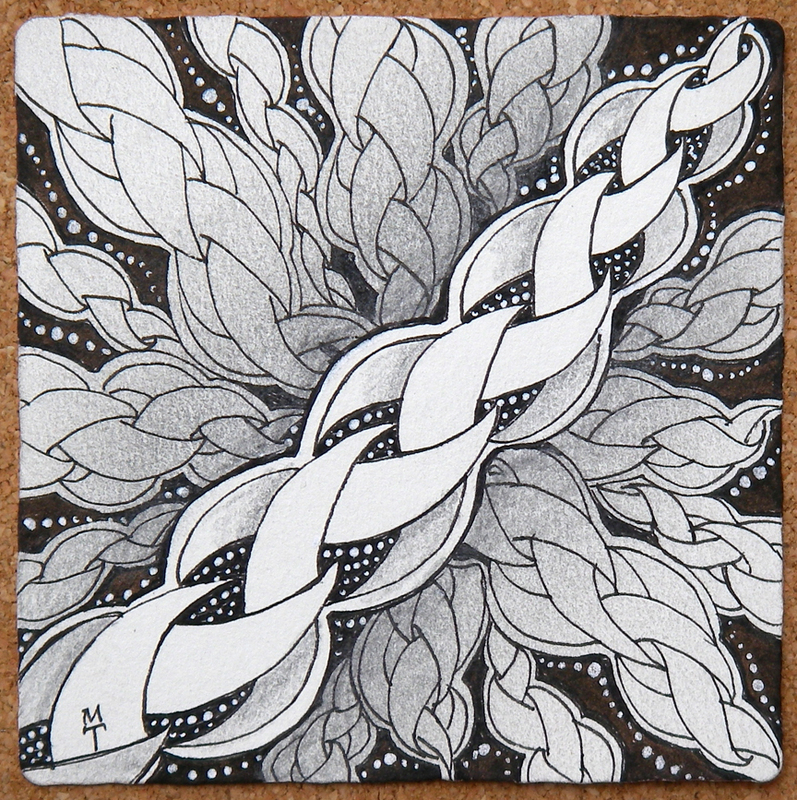 I used a variation of the Zentangle tangle chainging. This chain-like image represents strength . . . of family, friends and community. 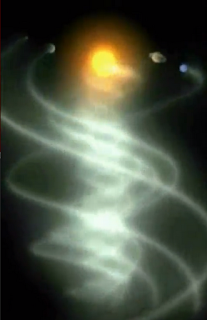 We depend on each other, whoever that may be. I like the simplicity of the single chain and the gossamer background representing the fragility of the world we live in. 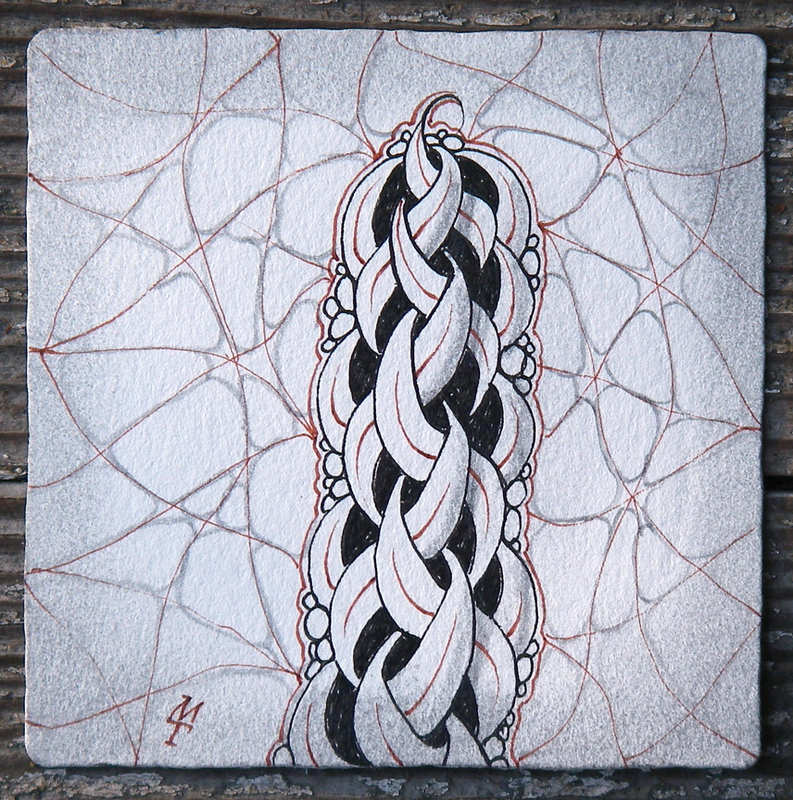 After Maria gave me these tiles to photograph, my morning web surfing took me to YouTube simulations of our galaxy moving through space and the intertwining spiral paths traced by the planets' movement. I noticed a beautiful symmetry between those patterns and what Maria created. We just received this and thought you might enjoy it as much as we did. In Honour of the Day and of course thankful for all the wonderful Tangles that have come my way, here is my Thanksgiving card that I am emailing out to friends and family this year. 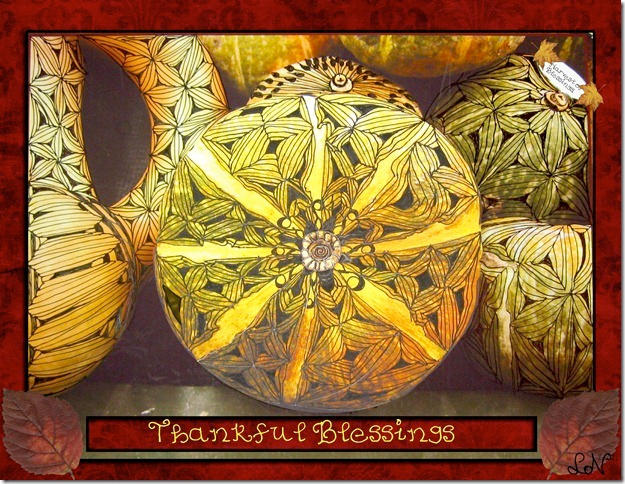 I had taken a picture of a collection of squashes and gourds at my local Safeway, printed it out first on ordinary copy paper so I could plot my Tangles, then once I was happy, printed it again but this time on matte photo paper and spent a few happy nights busily filling it in. I am particularly fond of how the Puf tangle still shows the original colour of the squash underneath it, even though the surface is literally all tangled up! 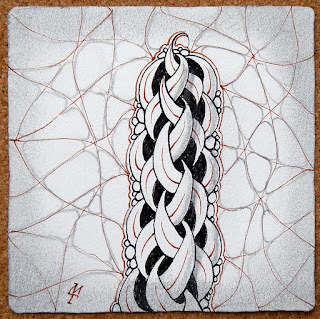 So credit and praise to Ms Carole Ohl [CZT] for her Puf tangle on which my variation is based! Thank you for sending that, "J"! At first we thought you had tangled the squash directly. Cool idea using the photographed squash as your string. 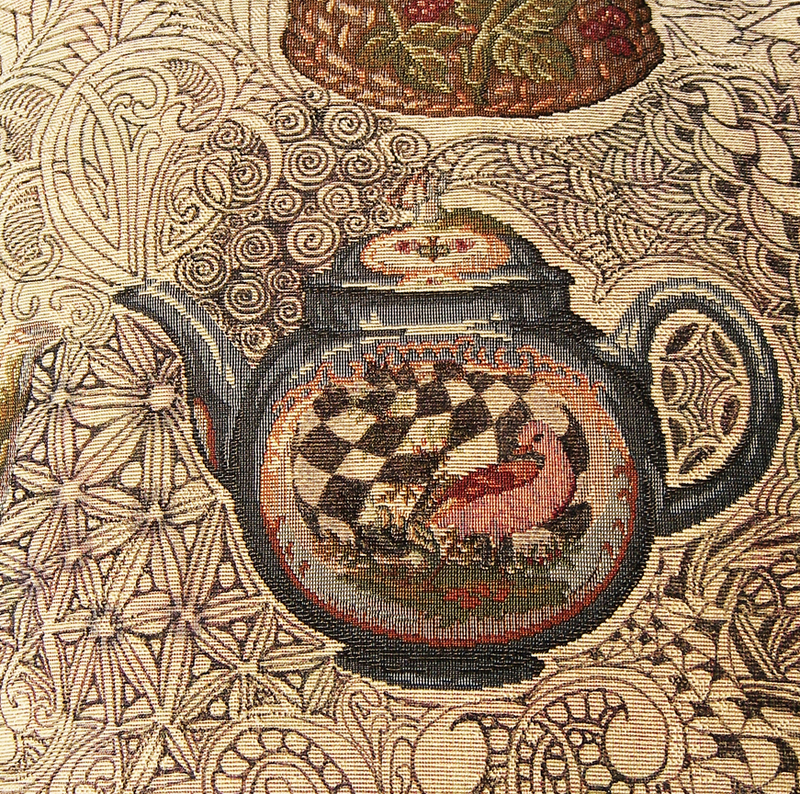 I have attached a photo of just one of my simple samples that I am using for my classes. 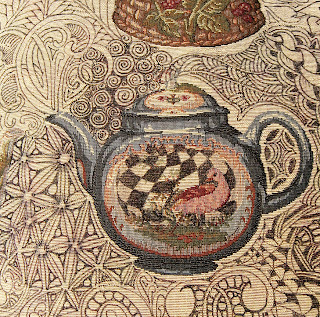 It is in the main all thread with just a little bit of grey Fabrico pen to create the pop effect as Maria suggested when you both looked at my coffee table sample book at the end of the CZT #6 session. 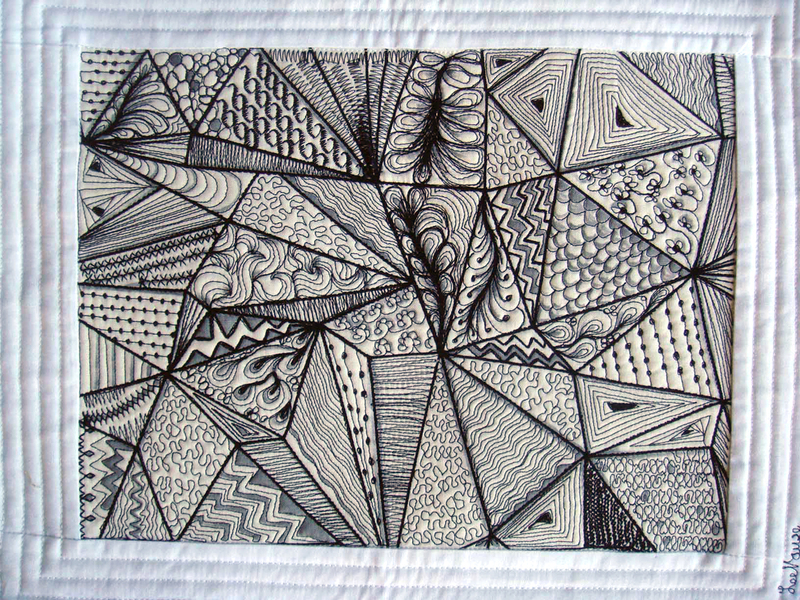 I first introduced my class to Zentangle via pen and paper and then led them into Zentangle with thread. Overall the results and feedback were very positive and a higher level of confidence was evident so I was satisfied with my approach. Congratulations and thank you for sending that, Lee.